The President of the Republic is elected by direct popular vote. Normally, a Presidential election is held every six years. If the incumbent dies or becomes permanently incapacitated, a new President shall be elected as soon as possible. The President must be a native-born citizen of Finland. The term of office is six years. The same person may be elected President for no more than two consecutive terms. A Presidential candidate may be nominated by a registered political party that has won at least one seat in Parliament in the immediately preceding Parliamentary election. A candidate may also be nominated by a constituency association formed by at least 20,000 enfranchised citizens. The first round of balloting in the Presidential election takes place on the fourth Sunday of January in the election year. If any candidate receives more than half of the votes cast (50% + 1 vote), he or she shall immediately be confirmed as the President-elect. Otherwise, a second round of balloting is held two weeks later between the two candidates who received the most votes in the first round. The candidate who receives the most votes in the second round shall be confirmed as the President-elect. In the event of a tie, the election is resolved by casting lots. The Government confirms the outcome of the election and performs the drawing of lots if necessary. If only one candidate is nominated in the election, he or she shall be confirmed as the President-elect without balloting. A President chosen in a premature election assumes office and makes the aforementioned declaration on the third day after being elected. The term of the President-elect begins, and the term of his or her predecessor ends, at the moment when the President-elect has made the solemn declaration. From 1919 to 1987, the President of the Republic was elected by indirect vote. First, 300 electors (301 in the 1982 and 1988 elections) were elected by popular vote; these electors then elected the President, not being bound to any of the candidates running for the office. Indeed, there were no provisions in legislation at all concerning Presidential candidates. The President was chosen by electors in the elections of 1925, 1931, 1937, 1940, 1943, 1950, 1956, 1962, 1968, 1978, 1982 and 1988. In 1987, a new two-stage electoral procedure was enacted, but this was only ever used in the 1988 election: first, a direct popular vote was taken on the official candidates, and in the same polling 301 electors were elected for the purpose of choosing the President in the event that none of the candidates received more than half of the popular vote (50% + 1 vote). 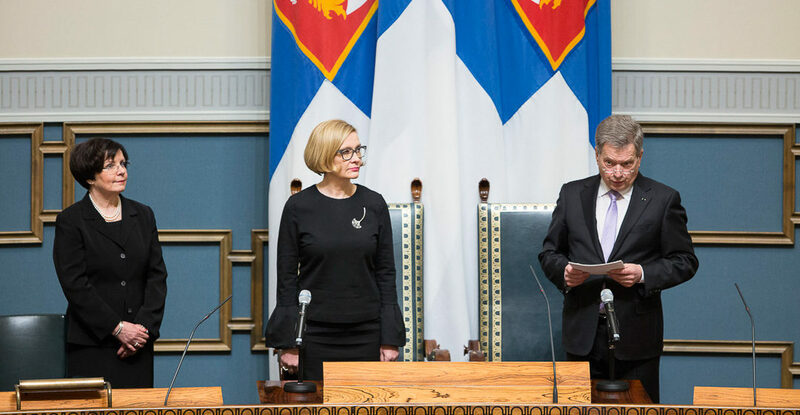 In the 1988, President Koivisto did not gain more than half of the popular vote, so the selection was left to the electors. The present electoral procedure was enacted in 1991 and was first applied in the 1994 election. 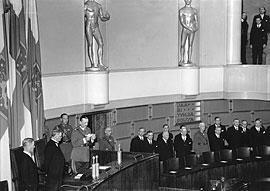 The electors elected in 1937 actually chose the President on three occasions – in the 1937, 1940 and 1943 elections. Under the exceptional wartime circumstances in 1940 and 1943, it was considered that an election to find new electors could not be held. C.G. Mannerheim, appointed President of the Republic by a special Act enacted by Parliament, made the solemn declaration of office in Parliament on 4 August 1944. Photo: Finnish Defence Forces. Exceptional procedures were followed in the Presidential elections of 1919, 1940, 1943, 1944, 1946, 1973 and 1982. In 1919, Parliament appointed Finland’s first President, K.J. Ståhlberg, pursuant to the provisions on the entry into force of Finland’s new Constitution. In 1944, Parliament adopted a special Act appointing Field Marshal Mannerheim President of the Republic for a term of six years after President Risto Ryti had resigned in the middle of his term. Mannerheim resigned in 1946, and Parliament adopted another special Act authorising the direct appointment of a President to replace him for the rest of his term (until 1 March 1950); Parliament then appointed Prime Minister Paasikivi to the office. In 1973, a special Act was enacted to extend the term of office of President Urho Kekkonen by four years (to 1 March 1978). The elections of 1940 and 1943 were exceptional in that the President was chosen by the same electors who had been elected in the Presidential election of 1937. The 1940 election was also premature because of the resignation and death of President Kyösti Kallio, and in that election a President was chosen for the rest of Kallio’s term and not for six years. The elections of 1944, 1946 and 1982 were also premature, resulting from an incumbent President resigning in the middle of his term.